Hugely versatile, entirely customisable and dead easy! 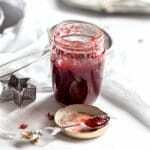 Grab your apron and get ready to make an absolute vegan staple – classic jam that can be used in sandwiches, cakes, cookies and all sorts of bakes! This zero-waste staple is the perfect companion to your morning toast and is absolutely essential in getting you through the winter months. Jam on a winter took away the blue devils. It was like tasting summer. I’ve never seen anyone prepare as vigorously as my mum does for the start of the winter season. As soon as August is done and dusted, she orders her ‘ozimnica’ – a hefty stock of staples such as potato and onions to last all throughout the winter period. And when I say a hefty stock, I really mean it (we’re talking 30kg of brown onions and 90kg of potatoes)! As part of the winter preparations, she will also make jars and jars of homemade pickles, make-from-scratch vegetable stock powder and the one and only – classic homemade jam. Whether you’re a dedicated baker or just a super lazy vegan always on the lookout for a quick snack – having your jam jar around can be a real game-changer! While I was visiting my childhood home in Slovenia last month, I made sure to book in a jam making workshop with my mum and penned down all the details to bring you this timeless vegan treat. Place your fruit in a wide cooking pan and add 50ml of water (don’t add any water if your fruit is particularly moist). Slowly bring to boil and simmer until you’re left with a very thick, even mixture (20-25 mins) keep stirring (or hand blend at this point). Add your desired amount of sugar – note that reducing the amount of sugar will reduce the longevity of your jam (1/2 kg of sugar means your jam will be edible for roughly 6 months). Keep stirring your sugar and fruit mixture regularly. Optional step: add a tsp of Ceylon cinnamon, pure vanilla extract and 2 tbs of rum. Simmer for additional 10-15 minutes and voila! How to check if your jam is ready? - Place a tbsp of jam on a plate and observe - if the jam is still runny and entirely loses its shape, you will have to keep on simmering until it reaches a thicker consistency and is considerably firmer. How best to store your jam? Grab your glass jars and warm them up in the oven (100C) for 10-15 minutes - this will disinfect them and ensure your jam settles better. Transfer your jam from the cooking pan to warm glass jars Close the lid and roll up your jam jars in a blanket to ensure they cool off slowly. Once the jam is cold (usually the next day) clean the outside of your jars and make sure to add a sticker noting down when you've made the jam. Yay! This recipe has been in my family for decades and I would be incredibly excited to see your own take on it – let me know in the comments below.